As well as providing you with a fantastic opportunity to expand your mind and develop your skills, an MBA also offers up another invaluable asset – the chance to build a network with similarly ambitious and talented people. Your classmates, professors, and fellow alums are the movers and shakers of the future. You get the advantage of meeting them now. So how do you not only meet potential collaborators and valuable connections who could change the course of your entire career, but also make lifelong friends? Getting an MBA presents unique opportunities to do just that, but you need to know how to take advantage of them. Whether it’s joining a club or going to cultural events, get out there and meet new people in an environment outside the classroom. And start doing it from day one. Whilst you may be inclined to hole up with your laptop, or stick to socializing with classmates, you’ll find you’ll run the risk of pigeon-holing yourself. If you explore other avenues, you’ll meet a whole other set of interesting, intelligent people. And science has shown that shared activities are one of the best and easiest ways to make genuine connections. In the same way, volunteering allows you to get to know a whole new bunch of people in the wider community, whilst developing deeper the relationships with fellow volunteers. Once you remove the pressure of ‘needing to network,’ you’ll likely stumble across friendly contacts, and exciting opportunities in a much more organic, and therefore meaningful, way. If you tend to shudder at the thought of ‘networking’, it can feel daunting to put yourself out there and strike up conversations with strangers. First, remember: you’re at a great business school and you absolutely deserve to be there – so sign up for an event, speak up, and show your worth. Pretty much everyone has suffered from a touch of imposter syndrome at one stage or another. If your reservations about networking go deeper, and you’re somehow concerned it’s “slimy,” you’re not alone. According to Jeffrey Pfeffer, a Stanford professor of organizational behavior, many people “believe it requires inauthentic, uncomfortable behavior”. If that sounds like you, try to reframe the process not as a transactional exchange of favors, but instead as a chance to help others, or an opportunity to talk about the subjects and causes you’re most passionate about. Making meeting people less about you and more about them or a worthy goal is the best way to remove the ‘ick factor’ of networking. Building a network is a lot like dating: you’re looking to forge connections with someone new and nurture an ongoing relationship. So make the first move: if you find someone you click with, ask them for a coffee, take them to lunch, or organise an event that you know they (and others) may be interested in attending. Invite along contacts you already have to give a talk on their expertise or share their views on a relevant topic… if it’s something you’d be interested in going to, chances are, others will too. Being the organizer of an event might sound terrifying to some introverts, but if they can get their heads around the idea, quieter types often report feeling more at ease when they’re the one handling the logistics. On Psychology today, Katharine Brooks, a self-professed introvert and author, urged her fellow introverts to try doing the inviting. “Because I’m the host, I keep busy with all the preparations and cooking, and I let my guests do the talking and mingling,” she explains. At an MBA event you might not spend much time in the kitchen, but shepherding around speakers or handling the coffee can work in the same way. Following on from the above, don’t be afraid to take hold of the microphone and demonstrate your own knowledge and insights. This is a strategy often embraced by aspiring stand-up comics – they’ll begin by acting as MC for more established, better known performers on popular comedy nights, hone their ‘peripheral’ material gradually, and eventually graduate to a fully-fledged spot on the bill itself. Learn from the speakers you invite to your event and work out what would make them want to listen to you. When it comes to networking, speaking up is important, but so is listening. 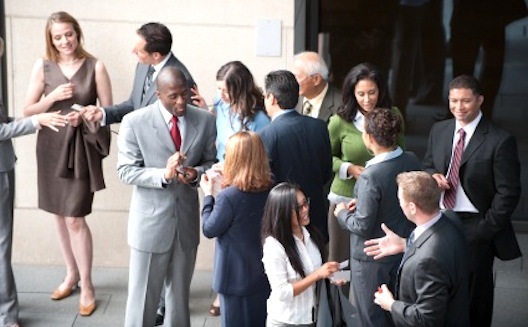 Networking events in particular can end up feeling like a shouting match, with everyone competing for space. In such an environment, taking the time to really absorb others’ words and demonstrate interest in what they’re saying can help you stand out from the crowd. As a very large added bonus, listening carefully also gives you the time and space to really consider your responses before simply blurting out something for the sake of speaking. The simple act of adding names and numbers into your contacts does not constitute building a meaningful network. That’s only the first step. Next, you need to actually reach out on the likes of LinkedIn, sharing information or contacts that could advance their ventures, or asking for advice. Follow up an initial chat with a quick direct message and be sure to check in with them every once in a while: like, comment, post, share. Without investing this little bit of time early on, you risk forgetting who you’ve met and wasting valuable networking effort. Whichever social media platforms or professional sites you use to promote yourself, be sure to keep your profile(s) up to date. Have a good, clear headshot that shows you in a professional, but approachable, light. Most of all, don’t be afraid to let a little personality shine through. Whilst the trend is for all things to go digital, it’s always worth having an actual business card, complete with your up-to-date contact details, for those who are a little more old-school. And more importantly, be sure to have several with you wherever you go. Having them somewhere is useless if you can’t get hold of one when you need it. It’s good to have a reasonable idea of who you’re looking for when attending specific networking events. Whether you’re there to seek out funding, technical knowledge, business advice, or simply inspiration, be clear on who you want to talk to and, ultimately, what you’re asking people for. Focusing your energies on striking up conversations with a select group of individuals you’ve taken the time to research will inevitably be a more successful approach than ‘carpet-bombing’ half the attendees with your elevator pitch and business cards. Equally, when you’re building a relationship with someone new and asking them for advice, be prepared to offer things up in return, because reciprocity always makes for stronger relationships. As ‘master networker’ Heidi Roizen puts it, “If you can’t find the win-win, maybe you shouldn’t ask the favor.” Take the time to consider ways in which you could support their ventures, or those of people who matter to them before you make your approach, and make sure your offer is both practical and sincere. Alumni are often great people to approach, because not only can they offer insights into post-MBA life but they’ve also been in your shoes. Be sure to subscribe to any alumni newsletters or emails your school sends out, go along to drinks evenings, attend webinars… get to know the alumni community. This way, you’ll quickly become familiar with former MBA students whose professional and personal interests inspire and excite you. If you’re at the right school, the sense of belonging you and your fellow MBA students enjoy will only deepen over time, so alumni are likely to want to support you in your endeavors. Once again, though, remember to pay it forward… one day, it’ll be you sharing your wisdom.